Last year, I met Pauline Eveno who told me about her concept which I found immediately brilliant. After several working sessions, we designed a perfect-fitted mouthpiece for me. A true luxury today when we know the very precise expectations of musicians. Syos is at the service of artists with a strong and contemporary concept. A wind of change in this industry that struggles to renew and live with its time. French tenor saxophonist born in 1984. 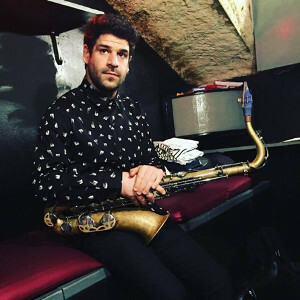 Firstly committed into rugby at a young age, Adrien Souleiman passionate himself for jazz music and starts playing the saxophone with John Coltrane and Stan Getz as idols. At 17, he decided to fully focus on his instrument by quitting high school and launch a musician career. he studied at the CIM, the American School of Music and the Courneuve Conservatoire in jazz. He stars as a studio musician and recorded many albums, with Dad among others and plays in different jazz bands like Beau Women. In 2016, he recorded his first solo album as a singer, Brille. This album of french chanson has knew great success.